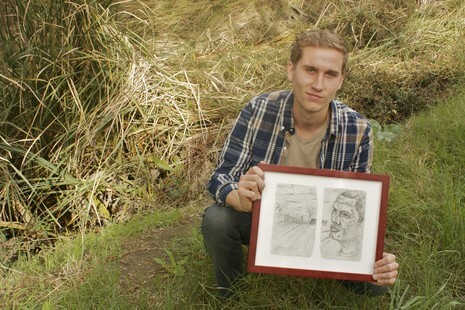 Senior art major Jason Leith ambled into an empty grass field in an abandoned lot a month ago, simultaneously wandering into the life of a stranger — a person who would become a new friend and spark of inspiration. Leith did not expect to find anything in particular leaving a breakfast meeting one morning to spend a few moments in thought and prayer in a nearby field. He was drawn to the location because he appreciated the aesthetic beauty of the natural space sandwiched between the busy streets near a La Mirada shopping center — only a five-minute drive from Biola University. When he saw a man settled in the opposite corner, he immediately felt compelled to talk to him. Before crossing the field, however, Leith hurried back to his car to retrieve his sketchbook and pencils. He started by drawing the cool, clear autumn day and began to put the raw landscape down on paper. Then, he approached the man, offered a friendly hello and politely introduced himself. The man, named Steve, has called a small cluster of pine trees hidden behind a dumpster his home for more than three years. Leith asked the homeless man if he could sketch a portrait of him. As he penciled in the man's rough features, Leith listened carefully as Steve struggled to tell his story through his speech difficulty. Eventually, Steve grew curious about Leith’s art, his life and why he was out there that day. He shared his faith in Jesus Christ and the direction that trust gave his life. When the sketch was finished, Leith saw his drawing clearly impressed his new friend. Leith left, assuring Steve that he would return for another visit soon. Since that day, Leith has begun using his drawing to help Steve. He has raised hundreds of dollars by auctioning off his portrait and selling copies of the original with a brief explanation of what ministry efforts he intends to pursue. Leith explained he wants to use the money he makes from his art to pay for Steve’s necessities like blankets, socks and food so he can come back to the field with a meal to share every week or so. Leith, who plans to use his talent for art to make a difference for the rest of his life, said this project is just the start. “There are so many people out there who are really in need and not easy to reach, mostly the people that the community neglects because they are difficult people,” he said. Leith's faith in Jesus Christ is what motivates him to connect with others, he said. He encourages people that improving the world can be as simple as taking a step out of one's comfort zone and using one's skills to help others. Written by Jessica Airey, Media Relations Intern. For more information, please contact Jenna Bartlo, Media Relations Coordinator, at jenna.l.bartlo@biola.edu or via phone at 562.777.4061. Reading your well-written article about Jason makes me so thankful to the Lord that I've known him his whole life. I love that he is using his talents for good and has this interest and love for those that are passed by when viewed by 99% of the world. He really does reach out in special ways to everyone around him. Love this grandson! Jason! i love your mission statement and it's application. Thanks for caring about someone the world passes by.